Ideal Developments takes pride in designing Luxury Custom Homes that boast the ultimate in curb-appeal. Ridgevale Drive is located in one of Markham’s most sought after luxury neighbourhoods, where streets are lined with grand entrance features and homes are nestled on rolling hills that surround the Rouge River. This tranquil location is nestled between premier Golf courses and both the Rouge and Bob Hunter Memorial Parks. This impressive 12,000 sq.ft. 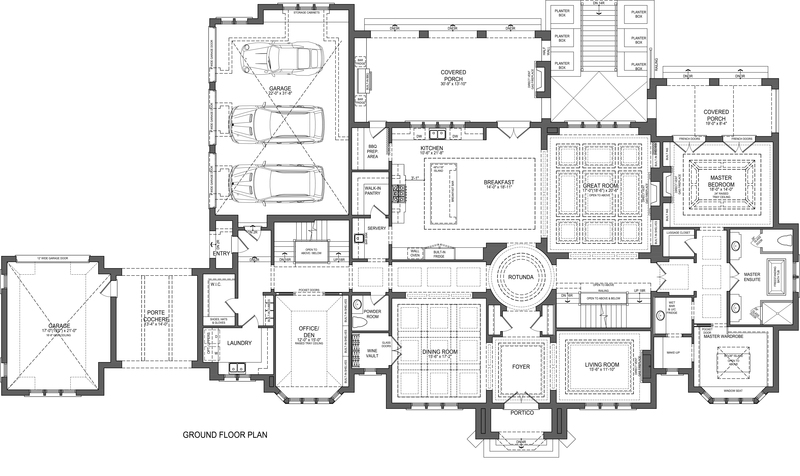 plus luxury home features a Porte-Cochere leading to a courtyard with 4-car garage access. The interior layout features 5-bedrooms and a second master bedroom conveniently located on the main floor with it’s own spa-inspired ensuite, make-up counter, wet bar and large master wardrobe with an oversized island. The Great Room and Dining Rooms are designed with oversized windows and are finished with beautiful waffle ceilings. The Dining Room features an elaborate wine vault, perfect for entertaining guests. The kitchen offers the ultimate culinary experience, with a large oversized island, professional appliances and direct access to a covered porch where you’ll find another outdoor kitchen and fireplace overlooking your backyard oasis, complete with swimming pool and tennis court. From top to bottom, this house has it all. Finished basements offer the ultimate entertainment experience with enough space to include a theatre, golf simulator, games room, fitness room and spa. Customers have the option to customize the layout to better suit the needs of a growing family, including a selection of the finest luxury finishes available. Ideal Developments has a team of design professionals that will help guide you through every step of the process. French Chateau and Romanesque architecturally designed homes with inspired combinations of stucco, stone and pre-cast stone accents, detailed exterior trim features in selected locations (as per elevation). Architecturally designed exterior colour schemes. Gracious covered porches, charming balconies and porticos (as per plan). Four car garage with sectional roll-up steel insulated garage door(s), with decorative glass inserts (as per plan). Garage doors to receive automatic garage door opener(s) (where required). Main entry door(s) featuring impressive solidwood single or double doors (as per plan). Pre-cast concrete pavers at front, rear and side entries (where applicable). Door hardware package including a grip-set and deadbolt lock, plus exterior coach lamps (as per plan). Fully drywalled and primed garage. Interlocking driveway that creates the ultimate curb appeal as per builder's standard specifications. Porch floors complete with flagstone your choice of colour and style from builder's standard samples. Soaring 10’ main floor ceilings (except in sunken or raised areas, stairways and where there are raised, dropped or cathedral ceilings). Coffered ceilings in Dining Room and Great Room (as per applicable plan). Elegant oak stairs and handrails in a natural stain finish, complete with closed riser and wrought iron spindles from builder's standard samples (as per plan). Custom Melamine shelving installed in all closets. Dropped ceilings and bulkheads over kitchen cabinets and main bathrooms (where applicable). Rough-in central vaccuum system (location may vary). Luxurious granite kitchen countertops with your choice of colour from builder's standard samples. Custom designed kitchen cabinets in a wide choice of styles from builder's standard specifications. Extended height kitchen uppers with crown moulding in kitchen. Backsplash from builder's standard samples. Quality bathroom cabinetry as per builder's standard samples. Granite countertops as per builder's standard samples. Master ensuite to have oversized acrylic freestanding tub as per plan with ceramic tile backsplash. All showers with chrome finish temperature control valves. Bathroom accessories in all bathrooms in chrome finish (as per builder's standard specifications). Mirrors included in all bathrooms. Single Light fixture installed above mirrors (as per builder's standard specifications). Double sink in laundry room with separate drain and base cabinets (as per plan). Optional Upper laundry cabinets in white as per applicable plan and builder's standard samples. Hardwood flooring on main floor (except tiled areas as per plan). 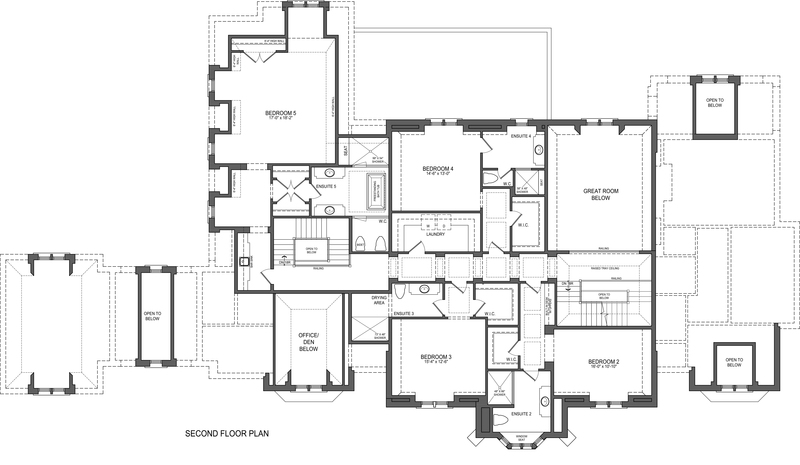 Porcelain tile flooring in entry foyer, mudroom at side entrance, powder room, bathrooms and laundry room (as per plan). 9" baseboards on main and second floor, 7" baseboard in basement, painted white throughout with doorstop to tiled or hardwood floor areas. 4" casing and backband combo, all doors, windows and flat archways thoughout painted white in finished areas. 2-Panel hollow core Interior doors. Not applicable to cold storage or exterior areas. French door(s) in Office/Den (as per plan). Spacious walk-in closets. (as per plan). 2-200 amp electric breaker panel located in basement (location may vary). High performance air conditioning units(s) provided for each living level. House is "gas ready" including line to BBQ (as per plan). Prices and specifications are subject to change without notice. Builder has the right to substitute materials of equal or better value. A wide variety of upgrades and options are available. E.& O.E. June 2015.